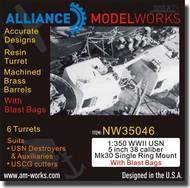 Aber Accessories ABR350L26 1/350 Set of 20 pcs 12,7 mm (0.5in) Browning barrels for US Navy ships. 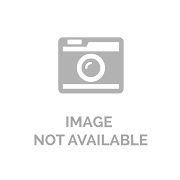 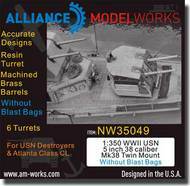 Aber Accessories ABR350L42 1/350 Set of Barrels for Saratoga, Lexington 203mm x 8; 127mm x 12. 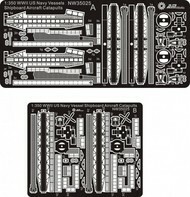 Aber Accessories ABR350L43 1/350 Set of Barrels for Japan Navy Yukikaze class Destroyer 127mm x 4; 25mm x 30. 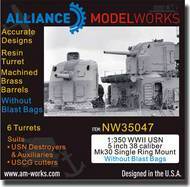 Aber Accessories ABR350L47 1/350 Set of 16 pcs 2cm barrels for German Flakvierling 38 with shields. 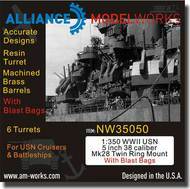 Aber Accessories ABR350L48 1/350 Set of Barrels for King George V class battleships 356mm x 10; 133mm x 16. 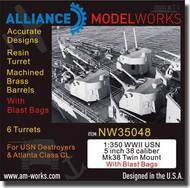 Aber Accessories ABR350L49 1/350 Set of Barrels for Japan Navy Akizuki class Destroyer 100mm x 8; 25mm x 20. 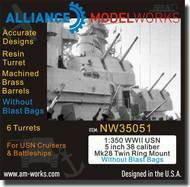 Aber Accessories ABR350L51 1/350 Set of Barrels for Arizona class battleships 356mm x 12; 127mm x 20; 28mm x 8.